Quite a few years ago I attended a lecture at Brown University given by cookbook author Katy Sparks. I was inspired by her philosophy on food and couldn’t wait to get my hands on her then new cookbook, Sparks in the Kitchen. I attribute that lecture for giving me my first intimate exposure to chipotle peppers. Katy did a short cooking demonstration highlighting one of my now favorite recipes from her book, “Squash Roasted in Foil Packages”. In this recipe cubes of butternut squash are scented with chipotle peppers, anise, and maple syrup – a delicious combination. Until then I had certainly heard of chipotles but never used them in my own kitchen. Chipotles are smoke-dried jalapeño peppers once only used in Mexican cuisine and are typically available dried or canned in adobo sauce. Today they are so popular you can probably find a few different brands of canned chipotles in adobo sauce at your local supermarket. Katy gave a great tip for using canned chipotles that I have utilized over and over again since that day. She taught us to simply dump the whole can of chipotles and the adobe sauce into a food processor and puree until smooth. The finished paste can be stored in any airtight container in the refrigerator practically forever. The puree is super spicy, so just add a little bit to incorporate a nice smoky heat to any dish. I find chipotles to be especially delicious when used it savory-sweet applications such as my Spicy Carrot Slaw. 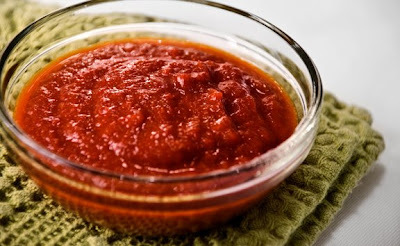 Dump the entire can of chipotles and the adobe sauce into a food processor. Puree until smooth. Transfer to an airtight plastic or glass container and store in the refrigerator.